There are probably a million different ways to do a coworkation, but the basic idea is to go on a retreat with a team or group of people with whom you want to achieve something: work on concrete projects; gather ideas and inspiration; or work on strategies and concepts. 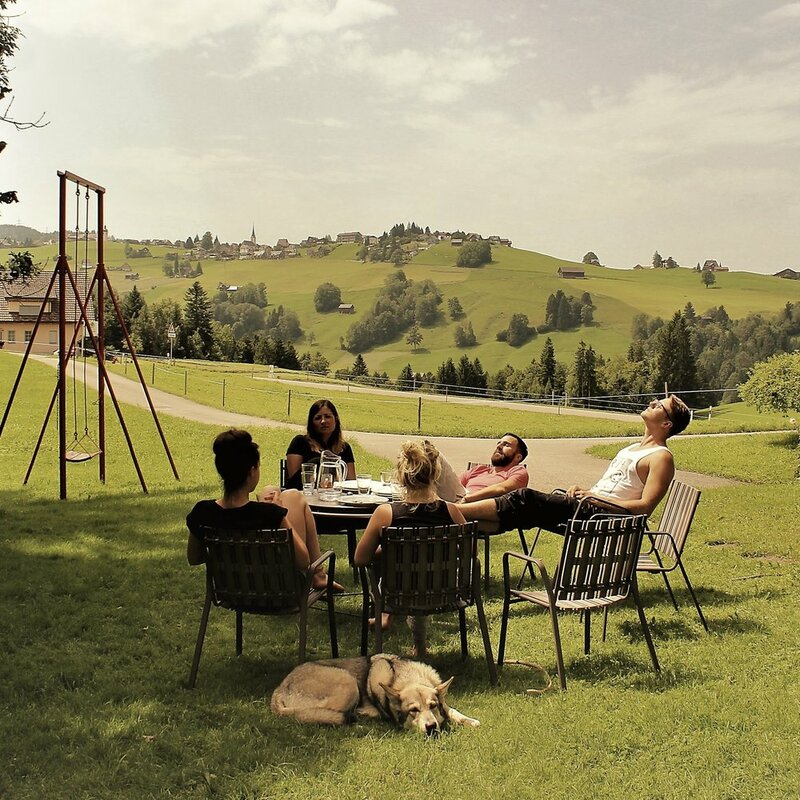 In my case, there were twenty of us in a big farmhouse in the canton of Appenzell, deep in the Swiss countryside. The building had room for thirty people, leaving ample space for each of us, and was set in large but charming grounds, with plenty of space for recreation. We were surrounded – by nature, cows (lots of them, we were in Switzerland, after all) and abundant possibilities for walks. On a sunny day I was one of the first to arrive at this secluded location, and was warmly greeted. I left my belongings in my small but cosy room, where a little note with my name and a flower were waiting for me; I was then shown around the house and introduced to the “concept of the week”. The location gradually filled up with all the participants. I was especially struck by the concept used for the wall with the program and structure for the week. Each day was split into early morning, breakfast, morning, lunch, afternoon, dinner and evening. Anyone could suggest program points for work or nonwork related activities. For example, people who had projects for which they wanted input suggested a day and a time to present it, and how long it would take. The same approach applied to leisure activities, with someone proposing yoga before breakfast, or going for a walk to the nearby river amid the sunshine. None of the program was set in stone, and the group decided at the beginning of each day whether the structure still made sense, setting the priorities for the day together. We always agreed the day before which two people would prepare breakfast, lunch or dinner. It was striking how easily and smoothly this process worked, with everybody working together to create a good and memorable experience. I am convinced that there is no better way to get to know people, how they work, how they behave in groups, how much they are willing to contribute to the greater good. The work sessions were extremely efficient and inspiring, as they were well “timeboxed” with deadlines and deliverables for each slot. As a result, we knew we wouldn’t have to spend the whole day working, and there would also be time for recreation and relaxation. I firmly believe that the combination of well-timed working sessions and free time helped me to be focused and inspired at the right time. Even when I had to prepare a meal with someone, I got to discuss all manner of topics with a different person, which was always a fruitful experience. As someone who needs their personal time, I also appreciated being able to retreat if I felt the need to do so and regenerate at my own rhythm. I experienced the coworkation as a very powerful opportunity for exchange, inspiration and getting to know one another in a very natural way. I would describe it as neither working nor holidays, but a whole new way of collaboration and doing things together. The experience was an uplifting mixture of efficient and regenerative. I returned home with a mind teeming with new ideas, a heart filled with memorable encounters and a body bursting with energy to take over the world!